Recommended Liberia Costa Rica Airport hotels for an overnight stay before or after your flight. If you're looking for budget lodging in Liberia City please see the bottom of this page for contact details and descriptions of backpacker and budget style accommodation. The Hilton Garden Inn is the closest hotel to Liberia Costa Rica International Airport. Located across the street from the airport the Hilton Garden Inn offers world class rooms for business and leisure Costa Rica travelers. Each room features the Garden Sleep System, Herman Miller ergonomic chairs, 32" LCD television, microwave, refrigerator and coffee maker. With a stay at Hilton Garden Inn Liberia Airport in Liberia, you'll be near the airport and close to Hidden Garden Art Gallery. This hotel is within the region of Liberia Parque Central and Church of La Ermita La Agonia. Make yourself at home in one of the 169 air-conditioned rooms featuring refrigerators and microwaves. Wired and wireless Internet access is complimentary, and flat-screen televisions with cable programming provide entertainment. Private bathrooms with shower/tub combinations feature complimentary toiletries and hair dryers. Conveniences include phones, as well as laptop-compatible safes and desks. Don’t miss out on recreational opportunities including an outdoor pool and a 24-hour fitness center. This hotel also features complimentary wireless Internet access, gift shops/newsstands, and wedding services. Grab a bite to eat at the hotel's restaurant, where you can enjoy drinks at a bar and dine alfresco (weather permitting). Or stay in and take advantage of room service (during limited hours). Quench your thirst with your favorite drink at a bar/lounge. Breakfast is available daily for a fee. Featured amenities include complimentary high-speed (wired) Internet access, a 24-hour business center, and complimentary newspapers in the lobby. Planning an event in Liberia? This hotel has facilities measuring 1184 square feet (110 square meters), including meeting rooms. A roundtrip airport shuttle is complimentary (available on request). 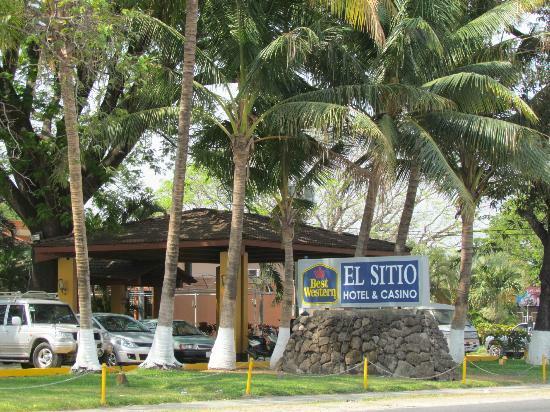 The Best Western El Sitio Hotel & Casino is located on the outskirts of Liberia, Costa Rica the capital city of Guanacaste where the Pan-American Highway intersects with the main road to the beaches. The hotel is only ten minutes away from Liberia International Airport so if you need an overnight stop after your arrival or before your departure the hotel is perfectly located. Facilities include swimming pool with the Rancho Bar and Restaurant right next to it. There's also a Casino on site as well as well equipped gymnasium with regular exercise classes such as yoga and pilates. Each room is equipped with air-conditioning, satellite TV, direct dial telephone and lock box. Full breakfast buffet included in rates. The Best Western Las Espuelas is a suburban hotel located near many restaurants and activities. We are only two kilometers from the city center of Liberia, Costa Rica. Visit the La Pacifica Zoo or relax on Playa del Coco Beach, both of which are near the hotel. The Best Western Hotel Las Espuelas boasts exciting, first-class amenities including fax and modem connections, an in-room safe, meeting and banquet facilities for up to 120 guests, an outdoor swimming pool, a security guard and 24-hour security. Hotel Boyeros is one of the oldest hotels in Liberia located only 15 minutes away from Daniel Oduber International airport in Liberia. Rooms - 70 rooms, all complete with air conditioning, cable TV, WiFi, telephone, hot water and balcony or terrace looking out over the gardens. Swimming pool - Large swimming pool as well as separate children's pool, surrounded by tropical gardens. Bar and restaurant service at "Snack Rancho" by the pool. 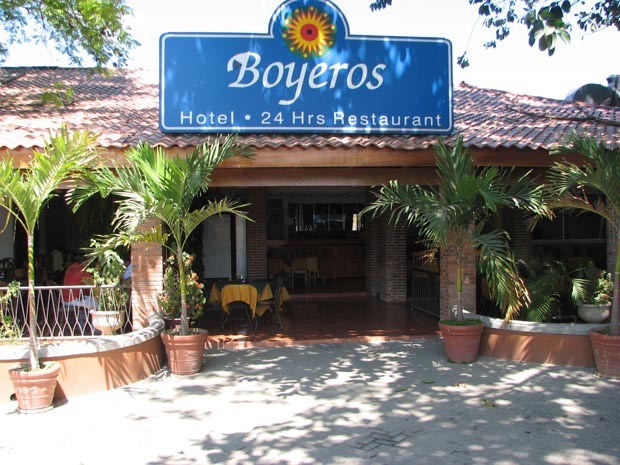 Boyeros Restaurant & Bar- Enjoy a cup of delicious Costarican coffee on the open-air terrace in Boyeros Restaurant & Bar. There is 24-hour service of international and local cousine available. Rates include all applicable taxes. Rates DO NOT include breakfast. Up to 2 children under 10 are free. The owners of Daisyta City and Resort Hotel have 27 years' experience in providing an excellent service to their clientele. Set in a quiet suburban area of Liberia this is a great hotel for unwinding in a very central location. The hotel is close to the beaches of Guanacaste as well as the internationally renowned and nationally protected parks of Santa Rosa and Rincon de La Vieja. Daisyta's colonial architecture and beautiful gardens allow you to enjoy a relaxing break under the Liberian sunshine as you sip a cocktail by the pool. * Additional High Season dates are 15-29 July and Easter week. LIBERIA COSTA RICA GUANACASTE TRAVEL INFO. | LIBERIA INTERNATIONAL AIRPORT, HOTELS AND TRANSPORTATION | SHUTTLES AND TRANSFERS TOURISM GUIDE of the strategically beautiful colonial city of Liberia at the northern of Costa Rica, which is the capital of the famous prime destination of Guanacaste province. We provide the best tips, news, maps, bus itineraries, taxis, car rentals, shuttles, private transportation, ground public transportation, tours, car rentals, expeditions, adventures, excursions, golf tournaments, hotels, hostels, rooms, resorts, ecological, cabins, villas, luxury and affordable accommodations, bed and breakfasts, rentals, and all kind of services and reservations so you can enjoy your vacations or holidays, trips for tourism travelers by land or air. Arrival and airport departures information. We can help you with your airline flights domestic ( Nature Air, Sansa and Lacsa) and international arrangements: American Airlines, Air Canada, Avianca, Southwest, Blue Jet, Delta, Alaska Air, Frontier, KLM, Air France, Sun Country, Copa, West Jet, Based on the proximity of the International Airport Daniel Oduber(LIR) we help tourists in departures and arrivals to visit amazing places from many sandy and sunny beaches, surf areas, diving, fishing or just exploring the abundant nature of this area bordered by the Pacific Ocean, the volcanoes, the lakes and the forests or National Parks where the ecotourism and the peace and the relax of a friendly culture in Costa Rica, the country of the Pura Vida lifestyle. Reserve and book today with us. We have great rates and high service standards in the main places downtown Liberia and at the best locations like Arenal Volcano an Lake, Blue River Resort, Monteverde, La Cruz, Papagayo, Tamarindo, Conchal, Flamingo, Nosara, Samara, Ostional, Nicoya, Santa Cruz, Playas del Coco, Hermosa Beach and many more gateways. Let us help in your stay at any top or rustic or ecological hotel in the area you are looking. From the Four Seasons Resort, Hilton Papagayo, Riu Palace, Villas Playa Samara, Tamarindo Diria, Dreams Mareas, Blue River Resort, Hyatt Andaz Papagayo, Allegro Papagayo, Barcelo Tambor, Barcelo Langosta, Borinquen Resort, Hotel Casa Conde, Coco Sunset, Exclusive Resorts, Hacienda Guachipelin, Hotel Boyeros, Secret Resorts, Marriott JW, Hacienda Pinilla, Westin Conchal, Flamingo Marina Resort, Blue River Dinosaur Park, Best Western, Mangrove, Ocotal Hotel, Playa Grande Hotel, Punta Islita, El Sitio, Bramadero, and much more, We also can help you with your real estate needs and get a good property deal for you. TRAVEL TO LIBERIA and go and visit Guanacaste.